Chu, Z., et al. (2010). Who is tweeting on Twitter: Human, bot, or cyborg? In Proceedings of the 26th annual computer security applications conference on—ACSAC’10. The 26th annual computer security applications conference (p. 21). Austin, TX: ACM Press. https://doi.org/10.1145/1920261.1920265. Durante, M. (Ed.) 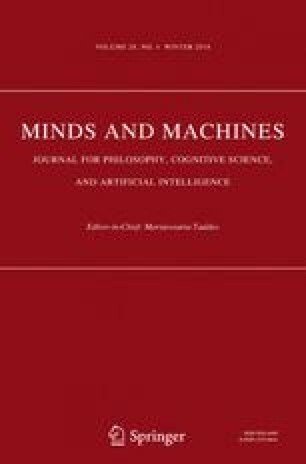 (2017) The morality of artificial agents. In Ethics, law and the politics of information: A guide to the philosophy of luciano floridi. Dordrecht: Springer, pp. 61–82. https://doi.org/10.1007/978-94-024-1150-8_4 (The International Library of Ethics, Law and Technology). Floridi, L. (2014) The 4th revolution: How the infosphere is reshaping human reality. http://site.ebrary.com/id/10867970. Accessed February 28, 2019. Stieglitz, S., et al. (2017). Do social bots dream of electric sheep? A categorisation of social media bot accounts. arXiv:1710.04044 [cs]. http://arxiv.org/abs/1710.04044. Accessed February 27, 2019.